Internet is well known for the tremendous revolution it is bringing about. It is now poised to become a pillar of the global economy. At the basis of the Internet is a system for administrating domain names and managing Internet Protocol addresses. The administration of the Internet names and addresses is currently performed by the Internet Assigned Numbers Authority (IANA), an institution which operated under the direction of late Jon Postel at USC/ISI, and is funded by the U.S. government. As of October I998, and following a global consensus, a new corporation, – the ICANN (Internet Corporation for Assigned Names and Numbers) – has been crafted which will be taking up where the IANA leaves off. A bit of history: in June I998, the U.S. issued a White Paper on Internet governance, which basically aims at transferring the administration of the domain name system. IP address space and other key Internet resources to the private sector, allowing for self governance with coordinated functions provided by a new non proﬁt corporation. As a result, a series of efforts to help create global consensus on these issues among all stakeholders are being undertaken with the organization of international fora. The ﬁrst workshop took place in Washington in April I998 with participants from North and South America. Europe and Asia. A second one was organized in in Brussels in June I998 for Europe, while in Geneva, in parallel with INET‘98 ( July 24 25.1998), a third forum was held. The Asia-Paciﬁc International Forum on the White Paper has been completed in Singapore (11 – 13 August I998). Latin America, The Caribbean and Spanish speaking communities held their International Forum on 20 – 21 August I998 to voice regional concerns. All forums aimed at building a consensus on the new mechanism for the transfer to private sector management of the technical administration of Internet names and numbers, as outlined in the policy White Paper of the U.S. However, Africa as a continent did not have much say in the discussion on the Internet governance. As Internet has now become a source of power, and the catalyst to so much potential, whether economic, Technological or cultural, countries who wish to get the most from it should also participate in its governance. The proposal for organizing an Africa forum on Internet governance participates to this logic. Commercial Internet proliferates in Africa region today and there arise a number of issues that pertain to regional and commercial aspects of Internet. A few examples would be : application-speciﬁc settlement scheme for roaming or fax/phone over Internet, regional coordination on the regional backbone/hub, particularly in relation to the US and EU, electronic commerce-related issues like Certiﬁcation Authority (CA), and so on. 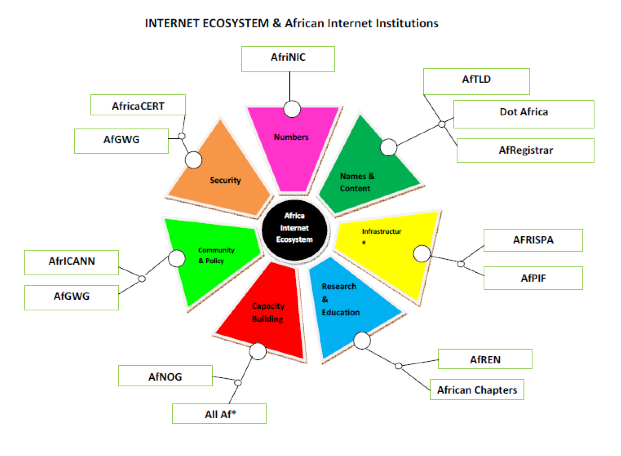 Formation of various regional groups such as African networking group, African tId group, African nic group, African (commercial) isp group, and user’s communities would be needed to generate the critical mass that is needed to make full use of the Internet for progress and development. In fact, Internet use in Africa now needs to evolve in a further step where Internet communities of interest should play a key role. Since Internet governance is a process that is essentially never-ending, discussions on email and Iistservs are encouraged in a view to provide an input to the process. However, to have a more comprehensive participation, we need to ﬁnd ways in which African emerging institutions should be strengthened. A regional forum with all stakeholders in Internet development on the continent will be a first step for Africa becoming an integral part of the continuing process. Funding and Technical assistance is important in the long run for organizing the African Institutions which are at various stages of formation. These are: AfriNlC, AFTLD, African Chapters, African lSPs, AISl, AIG, etc. They need to be consolidated and leveraged on past work while others should be envisaged. – To address issues related to the formation and development of Internet associations and groups such as local ISOC Chapters, academic/ research committees. policy and legal framework. – and to Organize a workplan for the Africa Internet Group. The event was organized by the Standing Committee of the Africa Internet Group and was attended by 134 participants from 34 African countries, Europe and the United States of America. The proceedings that are being offered here represent most of the papers and working documents and reports that were produced during the three day conference. We chose to reproduce them in their initial format and language. Where possible, both English and French versions are provided as a means of facilitating equal access to the documentation to all. As the Coordinator of the Conference, i now wish to commend all the participants, namely the presenters of papers, the consultants and all who brought their expertise to make this ﬁrst African forum on the Internet governance a resounding success. Besides, one of the outcome of the conference – that is the formation of an interim Board of trustees for the African Network Information center (AfriNlC) – is self explanatory: it was the mark of a will to move ahead; a will for action and cooperation. My ﬁnal words are for those without which we could not have organized the forum; these brought material contribution as well as their expertise: in this regard, it is my duty to acknowledge here the contributions of the UNDP, the Francophone Agency, the Internet Society, ITU, lDRC, NSRC, ECA, ADB, and many others.